The end of the current year is often a time for reflection on how the last twelve months have gone. Rarely, do we sit back and say: What a great year – I took time to relax, reduce stress in my life, and build healthy relationships and patterns that have served me well. While we may not have reached the level of perfection we would like there are a number of things that we can do in the upcoming year to improve our overall health and well being. Below are eight steps that will help you achieve a more balanced life, greater peace and joy. Detoxification can help one lower overall physical stress and improve overall wellness. It improves overall functioning of the liver and metabolism. However, too many people undertake detoxification programs that they find either on the internet or recommended by friends. Often these 'detox protocols' are not researched at all and can actually cause more harm than good. I recommend only those detoxification programs which have research behind them and are supervised by your family naturopathic doctor. 2. Do Energy Intensive Activities in Moderation. Studies have shown that endurance activities such as running, swimming and cycling are ideal for fighting stress and its negative consequences. However, these must be done in moderation – too little and there is no decrease in the stress hormones, too much and there is an increase in stress hormones. Done properly these activities help to decrease stress hormones while strengthening the heart and improving circulation. The endorphins released make you feel happier and more energetic. What about competitive sports? They are off the list as they create a new source of stress. Relaxation therapies like Biofeedback Therapy and Progressive Muscle Relaxation have scientifically-proven benefits. Meditation and yoga have also show great benefit in reducing stress. They all reduce muscle tension and agitation, making people more resistant to stress, relaxed and happy. For many years Vitamin D was the forgotten vitamin. After its addition to milk in the 1930's ­ to aid in calcium absorption in the the small intestine and the prevention of rickets in children ­ there was not much said about it. The belief was that it only played a role in calcium absorption and pretty much nothing else. This began to change about 15 years ago when it was discovered that multiple sclerosis (MS) patients had quite low levels of Vitamin D. This began a number of studies to determine if the disease caused the low levels of Vitamin D or if low levels of Vitamin D caused the disease. While the overall cause of MS remains a mystery to this day, it has been found that Vitamin D supplementation can often slow and in some cases reverse the progression of MS in many sufferers. This relationship between Vitamin D and MS lead to some other questions. With Alberta having the highest rate of MS in the world, studies were begun on the overall levels of Vitamin D in Albertans (and western Canadians in general). A number of studies have shown that at least a one point during the year, more than a third of people have low levels of Vitamin D.
Albertan (your naturophathic physician included)! Tanning booths are a poor option due to the substantial increase risk of skin cancer. So what is one to do? upper respiratory tract infections, overall immune function, and mood to name just a few. So what is your Vitamin D status? Find out! Book your appointment today! Earlier this year the University of Kansas published a study on the effectiveness of high dose, IV vitamin C in the treatment of ovarian cancer. It is interesting to note that the University of Kansas has been looking into high dose vitamin C (IV) for a few years now and the results are showing what naturopathic clinicians have found: that high dose vitamin C (intravenous Vitamin C) is an effective addition to chemotherapy. I, myself, have seen high doses of vitamin C give hope where the conventional treatment has left none. My preference is a complimentary approach to cancer - not one or the other but both conventional and naturopathic. The science continues to grow for alternative treatments. This helps yet further dismiss one of my pet peeves: uninformed people who say there is no science behind complementary treatment when actually there is quite a bit, but that is for another post. I use high dose vitamin C to treat cancer patients on a regular basis and find that it is well tolerated by patients and can be quite effective. It is important to note that you cannot simply take lots of vitamin C orally and hope it will work - it won't. The maximum daily oral dose that can be absorbed into the blood stream from the gut by whatever formulations one wants to concoct is about 8 g (8000 mg). With IV, most naturopathic doctors start at 25 g directly in the blood stream and get to a value of 100 g or more over time. The other important thing to remember is that at low doses (oral doses) vitamin C acts as an anti-oxidant and may actually help cancer cells survive (theoretically). However, at high doses (IV) vitamin C is a pro-oxidant which can aid in the killing of cancer cells. For many years mercury was our biggest concern. Through much public protest and based on the science mercury (Hg) was replaced with aluminum as the adjuvant in many vaccines. For many people this is not a concern, but for the select few (which we have no way of knowing in advance) it can be a major health concern and life changing event. Adjuvants make vaccines more effective. However, the aluminum can stick around in mast cells for years and slowly over time is transported to nervous tissue in the brain. So why use adjuvants? The short answer is that they make vaccines more effective. This means that less vaccine needs to be given and less doses to produce immunity within the person. Given this, there are recommendations within the European medical community (neurologists and others working with autoimmune) to produce adjuvant free vaccines. At this time the European Union is not willing to mandate this. With the issues around vaccines, toxic metals, and yes, even acetomenophin for post vaccine fever, patients and parents need to be more informed that ever. As a naturopathic doctor, I know that vaccines do play an important role in our lives and protecting us from some very nasty diseases. However, information is key and this is where I like to help patients and parents make informed choices. To see the issues around aluminum check out DW website at: http://dw.de/p/1CLK9 In addition, the show is being broadcast for the next few days. Autism and Vaccinations - a link but maybe not what you think! For years we have been looking for the cause of autism in our children. There were vaccinations which were proposed a number of years ago. There was antibiotic use for ear infections (which more often than not were due to dairy issues), and of course there was blame placed on parents (often mothers). Now there is another proposed culprit and there is at least a good correlation. So what is this smoking gun? Acetaminophen. That is right, there appears to be a correlation between the use of acetaminophen and the incidence of asthma, autism, and ADHD. Dr. William Shaw of Great Plains Laboratory puts together a interesting argument for acetaminophen being the culprit. If this does turn out with further study to be one of the major culprits, then the theories around vaccinations will have come so close to having found the culprit years ago. In a society where pain is to be dealt with immediately (think teething), and fevers to be avoided, acetaminophen quietly crept into our lives. Our children's fevers went down, they slept and we slept. However, the evidence (at a minimum) suggests that this needs to be studied further. And most importantly, we need to stop medicating our children with acetaminophen. The most shocking finding in the paper is that while Cuba has a very high vaccination rate, it has a very low autism rate. In Cuba, acetaminophen is not used to treat childhood teething issues, fevers, and post vaccination uncomfortability. If you want to be proactive with the medical care of your children, do not hesitate to meet with us. We can help with less harmful ways to deal with fevers, teething and overall general preventative care for your child. Pizza is a vegetable. Yes, many of my patients have heard me say this. Why? Because the USDA declared it a vegetable after lobbying by a number of food companies. So why is it a vegetable -- because it has some tomato paste on it and may have the occasional vegetable thrown on the top of the pizza. Actually, getting it declared a vegetable allowed food companies to get it into the school lunch programs in the U.S. So thanks to the same government department that gave us the Food Pyramid, so too pizza as a vegetable. We often like to think in Canada that things are different - but are they? I would suggest not. Most of the Government of Canada's Food Guide is almost exactly the same as the USDA Food Pyramid. Sure the graphics are different and how it is presented differs as well, but the information is almost identical. For the last 60 years, since the introduction of a very high carbohydrate diet (pushed by grain companies who had a surplus), we have seen a steady increase in obesity, diabetes, high blood pressure, etc. We have been told fat is bad and actually makes us fat. However, the research has not borne this out and it is carbohydrates which make us fat (converted in the liver). If you are tired of being tired (pun intended) - come and learn about a new way to eat at our clinic. Many of my patients come in with digestive (and skin - they are linked) issues and find that through diet their condition resolves. If you are fed up and want to learn more about our food. Contact our clinic - we have free movie passes to the airing of the the documentary - FED UP which looks at food in North America. Mental Decline and Fish Oil? There has been much debate about the usefulness of fish oil over the last couple of years. Some research shows benefit and other research does not. Unfortunately, when one looks closely at the studies often the very fish oil is to blame. To often poor quality fish oil is used and in amounts that are of no real benefit. I remember discussing with a pharmacist about the fish oil they were selling. Her face dropped when I suggested that my patients would have to take 20 capsules a day to get enough DHA and EPA. In regards to the benefit of fish oil and mental function, there is an interesting research study done by Tuft's University. In the study they found that grouping people on the basis of EPA and DHA consumption those with the lowest intake (lowest 25 % of participants) had the greatest cognitive decline over a two year period. One of my biggest concerns is the quality of the oil as well. Almost all fish oil is tested for heavy metals, but not necessarily PCB's. Also, the cheaper the product the poorer the quality of the oil. If it is not converted back into a triglyceride when it is refined there is no real benefit in taking the product no matter what the DHA and EPA levels are. Earlier this past week I had the pleasure of removing a deer tick from a close relative. This of course was immediately followed with treatment to prevent the development of Lyme disease. While there are not many confirmed cases of Lyme disease in Alberta or Canada for that matter, the number of cases is continuing to grow in Canada with the warmer winters. 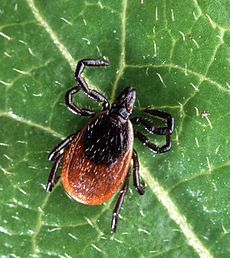 Lyme disease is caused not by the deer tick itself, but the bacteria it carries (Borellia burgdoferi). The bacteria enter into the body when we are bitten by the tick. Often a target or bullseye rash forms with the infection. Symptoms of Lyme are similar to that of other spirochaete infections. Symptoms can include fever and general malaise, and can affect the heart, central nervous system, and joints. Long term or chronic infections can be difficult to treat and often include chelation and antibiotics. However, with continued treatment many patients find improvement. I have treated a number of patients and it is very rewarding to see the improvements. If you spend time out doors in the wilderness (camping, hiking, horse back riding, etc) and are suffering from an illness that no can quite explain - you may want to look into testing (and yes we do offer it in the clinic). Interesting fact: Lyme - from Lyme Connecticut, where it was first discovered. Why do we eat so much? There are a number of reasons that people eat too much. Take a group of 5 people and together they could probably come up with 50 reasons. However, we often over look some causes and others are new. The article in the Huffington Post is quite good - it serves both as a reminder to us all and mentions a few new causes. Small print on the bottles - we often are not told how prescription medicines will affect us - for some drugs - it affects our waist line. The Veggies in Your Cupboard - this was a surprise to me as I was not aware that Bis-phenol A (BPA) affected appetite. The Snow Drift - living in Alberta this is a common problem for six months of the year. More snow, colder temperatures - the salad does not look as tempting. The Habit that Saves You Time - this is one of the biggest problems that many people encounter. They eat at their desk and continue to work. Eating while stressed causes us to gain more weight as our body believes it needs to conserve resources. The Drink in the Lunch Bag - often I find this is not a problem for most people. However, the sugar filled fruit is often the substitute. Grapes taste good but are loaded with sugar. The Cravings that Discriminate by Gender - this is a common one for women just before the start of their period. There is much that we can do in the clinic to help reduce not only the carb cravings but also, PMS in general. The All Nighter You Pulled for Work - again, I do not find this to be a big issue for most people. BUT! Many people make compromises with sleep and believe that they can get by on less than 8 hours. Not so. A restful night's sleep is one of the most important aspects of our daily life. Want to know more? Book an appointment today! I have been following MERS for quite a while now. Like many of the viruses out there, it has the potential to affect people but is generally hard to catch. However, 45 % of all cases have been reported in the last month. With a death toll of about 25%, hopefully it will remain an illness that is not that common. Along with MERS, measles is also in the news. For those who have been vaccinated it is believed that the vaccine is about 95% effective. For those who haven't it is important stay away from areas (places and events) where exposure is more likely. And again, make sure your overall immune health is a focus. By the grace of God, you actually were not exposed to the infective agent and so you didn't get sick. You were exposed and the virus/bacteria decided to set up shop but due to past exposure you had antibodies that attacked the agent and you recovered quickly (these are often the people who feel something coming on but it quickly resolves). Your immune system is so depressed due to stress, fatigue, and poor diet/lifestyle that the virus or bacteria simply infects you and sets up home (more common with viruses). These are often the people who never get sick until they are on a holiday (if they are lucky)! No matter what your current health status it is important to remember that your ND (naturopath) is here to not only treat your acute conditions, but to help you achieve better health in everyday of your life. This is Dr. Michael's blog written from the great metropolis of ﻿Edmonton﻿ and providing you ﻿naturopathic information﻿ - enjoy!